With the Toronto Maple Leafs holding the top pick in the draft for the first time in 31 years, the 2016 NHL Draft marks a historic moment for the club, and to celebrate the occasion the team unveiled the new uniforms that will be worn beginning with the 2016-17 season, the team’s centennial anniversary. The newest member of the Toronto Maple Leafs, Auston Matthews, was presented with the new sweater on stage after being selected first overall, helping officially unveil it to fans. 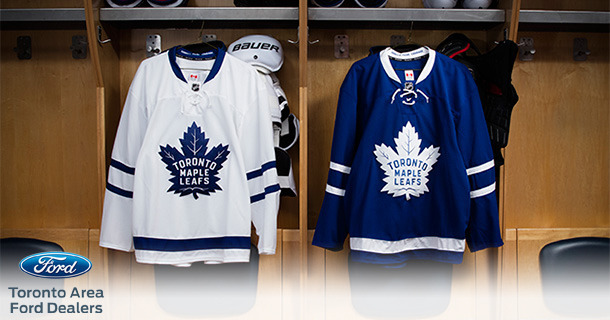 The club’s new uniforms are inspired by the iconic Maple Leaf uniforms of the past and feature a larger version of the team’s new logo, unveiled in February, than in past uniforms to place emphasis on the badge. Other distinguishing details include the classic four stripes on the sleeves with a single band across the bottom of the sweater and “Honour. Pride. Courage.” Stitched inside the collar. •The new Maple Leaf has 31 points, a nod to the year 1931 and a defining moment in team history with the opening of Maple Leaf Gardens. The new logo maintains a strong connection to the classic Leafs logo of the past while offering a fresh take on it for the future. •The new badge contains a total of 17 veins, representing the year the franchise was founded (1917), and includes 13 veins at the top of the crest to commemorate the club’s Stanley Cup Championships. •The outline, seen in the most recent version of this Maple Leaf from 1963-1967, has been removed to create a cleaner, bolder look. The new Maple Leaf sweaters will be available for sale at the Toronto Maple Leafs Store Powered by Real Sports Apparel on September 1st with an online pre-sale available on August 1st.